Under the reign of Kamehameha III, Hawaii’s traditional system of land use underwent drastic change. Guided by foreign advisors, the king divided lands that had formerly been held in common and administered by chiefs and their konohiki, or overseers. The Mahele allocated 23% of land in the Islands to the king (called crown lands); 40% comprised konohiki lands to be divided among 245 chiefs; and 37% was declared government lands, to be awarded to commoners who worked the land as active tenants. An appointed Land Commission and Court of Claims administered the land division. The Mahele was followed in 1850 by the Kuleana Act which established fee simple ownership of land. Historical land tenants were required to document their claims to specific parcels in order to gain permanent title. Once granted, a kuleana plot was entirely independent of the traditional ahupua’a in which it was situated and it could also be sold to parties with no historical ties to the area. 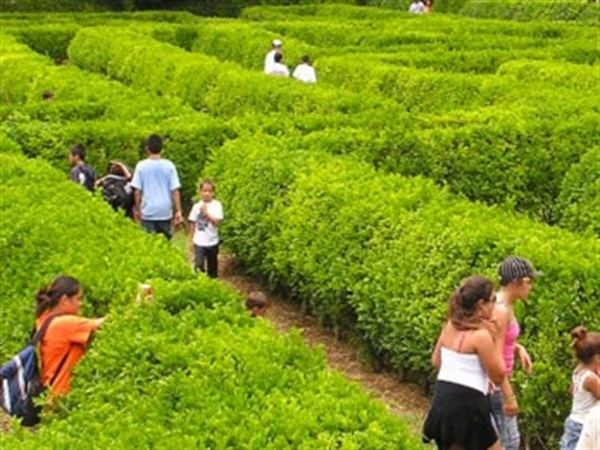 Children from a two to eleven years old can enjoy the fun of searching for over 2,000 plastic eggs during a Free Easter Egg Hunt this year at Botanical World Adventures, north of Hilo. “We wanted to give back to our Hawaiian community and just felt this is one fun way to do that,” explained Kika Nixon, Guest Services Manager at Botanical World Adventures. Mrs. Nixon said the Easter Egg hunt actually will take place on both Saturday and Sunday, April 4 and 5. The egg hunt starts promptly at 10:00a.m. each day. Children will gather the eggs then turn them in for candy or prizes. 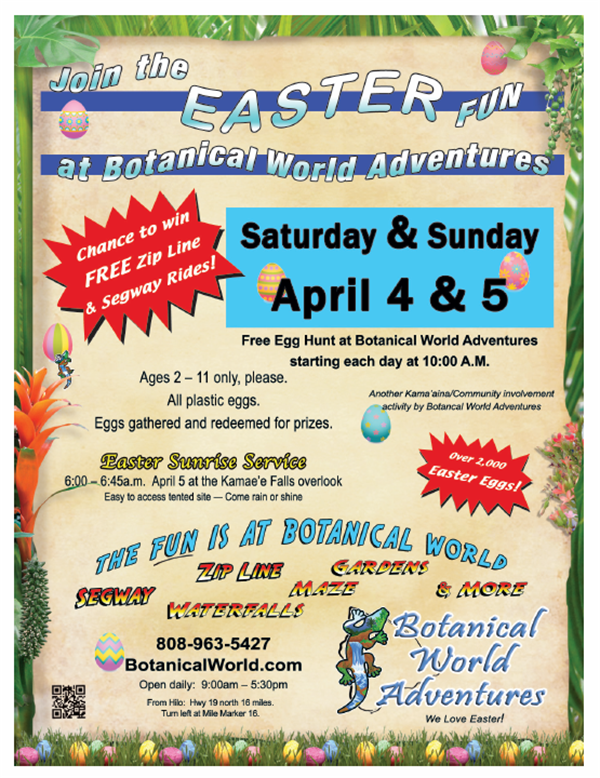 Admission to the World Botanical Gardens at Botanical World Adventures is free for children and families attending the egg hunts. A special Sunrise Service by the Hilo Coast United Church of Christ will also take place at Botanical World on Easter Sunday from 6:00 – 6:45a.m. 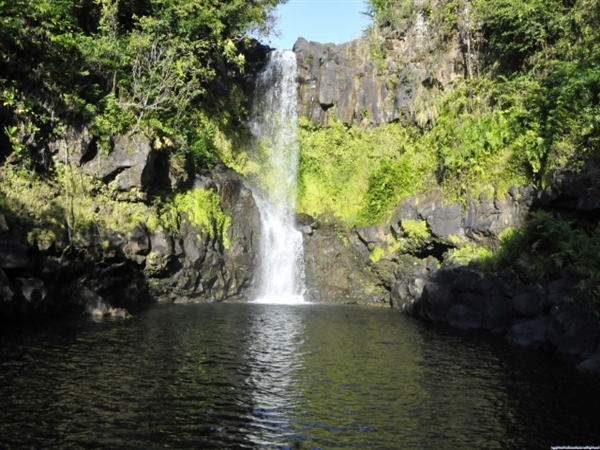 “Everyone is welcome… The service will be at the Kamae’e Falls overlook, with easy to access to a tented site, come rain or shine,” according to the Guest Services Manager. Programs of sacred music are performed in many towns and cities in the United States on Palm Sunday. They are often sponsored by and held in local churches but they may also be part of the musical community’s regular concert series. These programs usually begin on or before Palm Sunday and may continue throughout Holy Week. Bethany College’s Messiah Festival in Lindsborg, Kansas, has been held during Holy Week for more than 100 years. 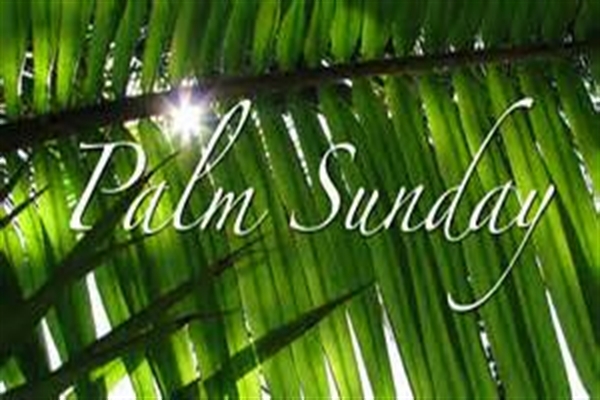 Plays or pageants that focus on Holy Week themes are also performed on Palm Sunday. The Blessing of the Fleet in St Augustine, Florida, takes place on Palm Sunday each year. Shrimp trawlers and other fishing boats, as well as privately owned vessels, visit the town to receive a blessing. It is also customary for Christians to place blessed palm leaves in the shape of a cross behind religious images or statues in homes, stores and restaurants in the United States. Palm Sunday is not a federal holiday in the United States. However, it is held on a Sunday, which is a non-school day and non-working day for many Americans. 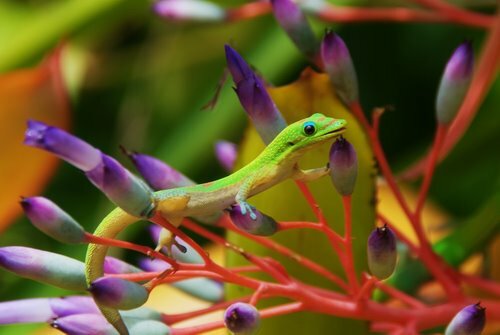 So why not spend it at …Botanical World!! The red variety is the most common, but other varieties may be pink, or white or white mixed with pink (rather uncommon). It is suitable for a sunny to partly shaded location in a larger sized landscape setting. There are two types of shoots produced by this plant—leafy or vegetative, and flowering or reproductive. The leafy shoots can attain a height of almost 30 feet in sheltered, moist locations (like gulch bottoms) and live for almost two years before dying down to the rhizome in the soil. The reproductive shoot doesn’t produce any foliage leaves and is crowned with a terminal inflorescence of colored bracts and gold-edged flowers. Although a member of the ginger family, it is not the source of the spice we call ginger. 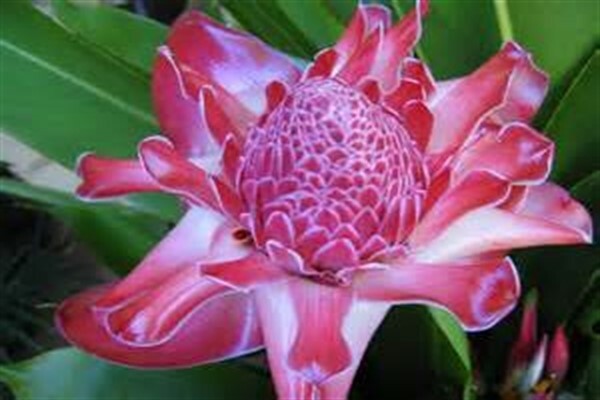 Torch ginger inflorescences are utilized by florists in large-sized floral arrangements both for their beauty and their longevity. Press the pound key for more information on the Torch Ginger flowers and reproduction. Some people think of the whole torch-like top of the reproductive shoot as being a flower, but this is not the case. Flowering begins as a ring of gold-edged flowers emerges around the base of the cone-like mound of small bracts and gradually works its way up the mound of bracts to its tip—a process that takes a month or more to complete. If pollination is successful, a firm fleshed pink fruit (berry) will be produced—potentially one for each flower—which, along with dozens of other coalescing berries, will somewhat resemble a pineapple if enough berries are produced.